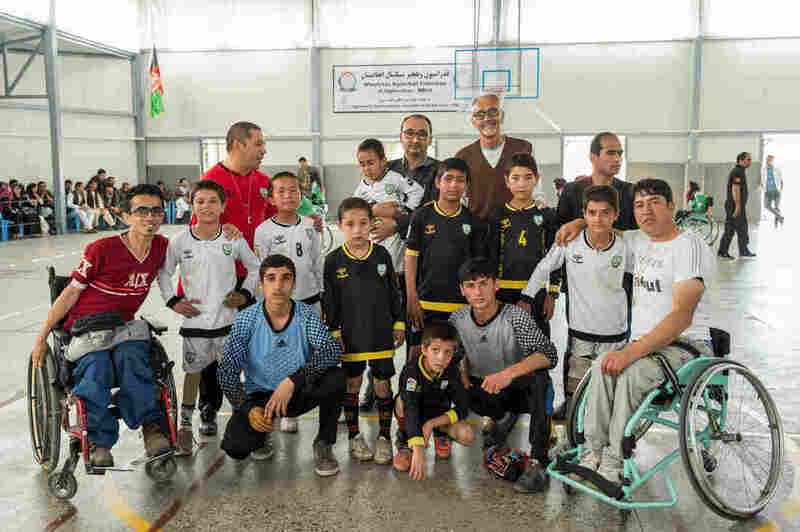 Wheelchair Basketball Is Transforming Lives In Afghanistan : Goats and Soda The head of the Red Cross orthopedic program wasn't sure a basketball team was a good idea. The players proved him wrong. Alberto Cairo (back row in brown sweater) poses with his staff and players at a basketball tournament in Kabul, Afghanistan. 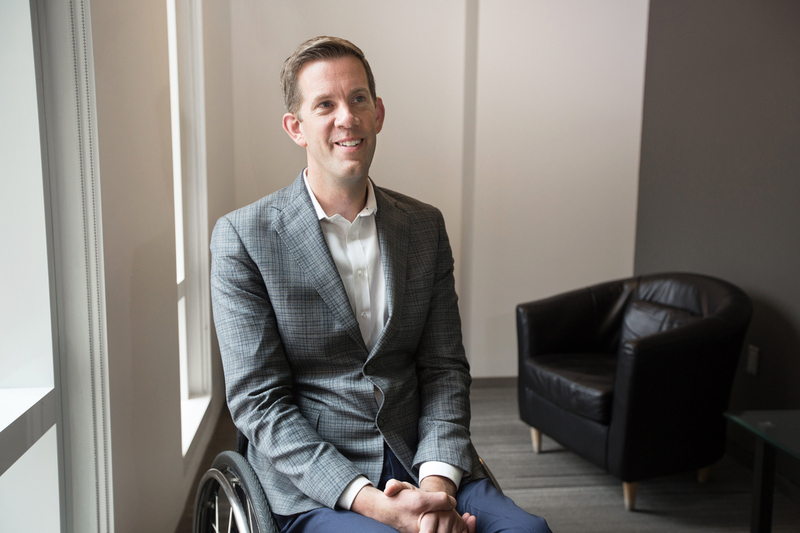 When he was 10, a war injury put him in a wheelchair. His spine was permanently damaged. He was so depressed there were days he refused to get out of bed. Now Mohammadullah Amiri can't wait to get up in the morning. Mohammadullah Amiri, who was paralyzed when he was a child, has transformed his life since he started playing wheelchair basketball in Afghanistan. It's all because of wheelchair basketball. Since the 36-year-old from Afghanistan discovered it, he has become a changed man, says Jess Markt, his coach. "He has this full life. All that has come since he played basketball," says Markt, an American who trains wheelchair basketball teams for the International Committee of the Red Cross in countries like Afghanistan, South Sudan and India. Like Amiri, he has paraplegia. 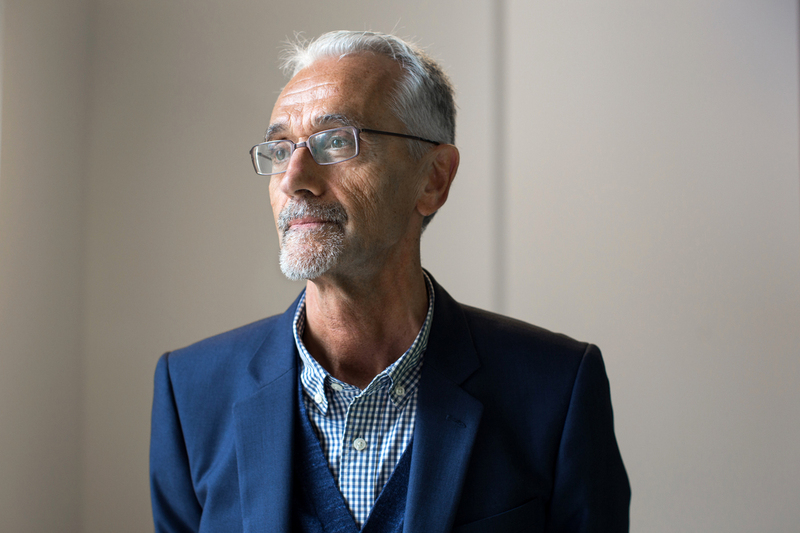 Since 2011, Markt has been working with Alberto Cairo, head of the Red Cross orthopedic program in Afghanistan, to get people who have been physically injured from war or illness to play sports. Cairo, a physical therapist from Italy, has helped over 100,000 people learn to use prosthetics or re-learn to use their limbs through physical therapy. 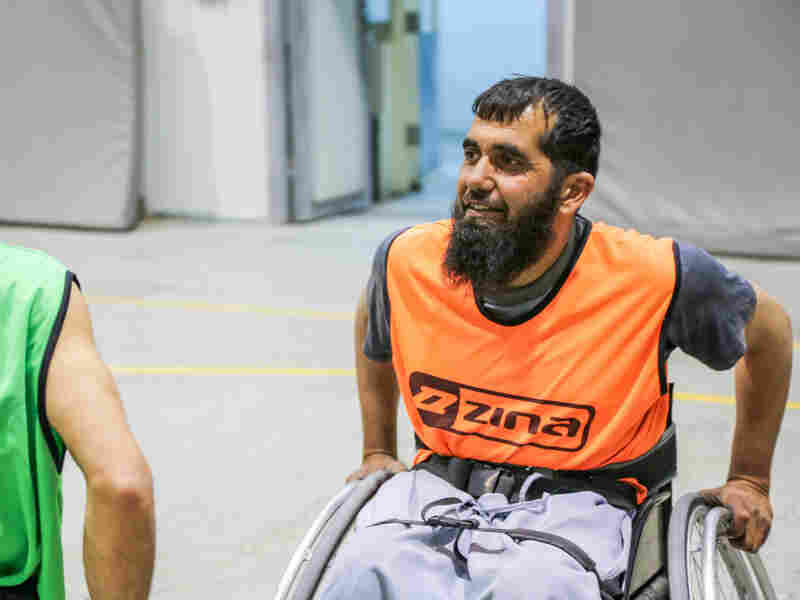 Wheelchair basketball has been a game changer for the patients, says Cairo, who has been living in Afghanistan for past 30 years. "Rehab is painful. Learning how to use artificial limbs is painful, too. For the first time with this sport, we were able to give only fun, only joy." Today, there are 500 recreational players and a national men's and women's wheelchair basketball team across the seven Red Cross rehabilitation centers in Afghanistan. The national teams haven't won any international tournaments just yet, but Markt has his eye on the Paralympics. Markt, 40, and Cairo, 60, visited NPR headquarters in May to talk about what they've learned from their Afghan patients, how people with disabilities are viewed in Afghanistan and the power of a high-five. This interview has been edited for length and clarity. How did the idea for wheelchair sports come about? Alberto Cairo: People asked me, "Can you do something for our leisure time?" I was a bit reluctant. In Afghanistan, there are so many things missing [like basic infrastructure]. To waste your time in leisure is something that should not be done. But that's a mistake. So we decided to start some sport activity. Cairo, a physical therapist, says wheelchair basketball has been a game changer for his patients. "Rehab is painful. Learning how to use artificial limbs is painful, too. For the first time with this sport, we were able to give only fun, only joy." Seems like that turned out to be a good idea. What else have your patients taught you? Cairo: In the beginning, the physical rehabilitation center was only for war victims. But I remembered, there was a lady. She kept coming, bringing her child with polio. He was not, strictly speaking, a war victim. That's why you didn't want to treat him. Cairo: If you are a child with polio, it's because you were not vaccinated. This lady kept coming. She told me: What is the difference between my son, who is paralyzed, and that man sitting over there who is paralyzed because of a land mine? Both of them cannot walk. Then I understood. The Afghans opened my eyes. I learned to listen to them. Very often, they give me the right path. Is there stigma around people with disabilities in Afghanistan? Cairo: In Afghanistan, if you're disabled, you're not rejected from the family and the community. There is a kind of hyper-protection. The family says don't worry, I will take care of you. It's nice in a way, but it's disempowering. Patients should be given the chance to restart their lives. What has been the impact of the wheelchair basketball program? Jess Markt: We've seen the players, one by one, go through this transformation as they started to play sports. They no longer think of themselves as disabled people. Now that they started playing basketball and [achieving] success, people come to watch them. The [audience is] amazed. The ones that are most successful get to play on the national teams, play internationally and have their national anthem played for them. They wear the flag of their country on their back, and people watch them on television. Jess Markt has been working with Cairo and others to create sports programs for disabled people in war zones. He has his eye on the Paralympics for the Afghan national basketball teams. Tell me more about Amiri. Markt: He comes from a pretty conservative family. He's got a big long beard, a serious expression; he's quiet, a little stern. As I got to know him, I found out he was the sweetest person. Amiri was injured during the war when he was a child. He was a patient of Alberto's. When he went home after his rehab, he went back to an environment where he wasn't expected to contribute to his family. He had no active life. Then he started playing wheelchair basketball [at age 29] — and very quickly, he went through this transformation. He said, how could he be sad? He always had basketball practice to look forward to. He's more severely disabled than a lot of the players. But he worked very hard, and now he's a member of the men's national team. He's an extremely valuable player. He was one of the first to understand concepts like making your teammates better. Instead of always calling for the ball and wanting to score for himself, he found ways to make everyone else score. He has also benefited from the Red Cross microfinance program, which makes small loans to patients. Markt: Not only has he become a really great basketball player and coach, he used one of the microcredit loans to start his own automotive parts and repair business. He's the center of his community when he's at his shop. Cairo: When he decided to get a microcredit loan, he gave back his relief card — the card that all disabled people get that entitles them to receive every month some food. He said, "No, I don't need this anymore. That's charity. I have a job now." Jess, you coach the women's wheelchair basketball team in Afghanistan, one of the hardest places in the world to be a woman. In a society where physical contact between men and women is limited, how did you teach them to shoot hoops? Markt: I was very lucky in that whatever combination of being a foreigner, a teacher and in a wheelchair allowed me a pass that I could coach them. I had to be careful that I was doing everything within their cultural boundaries. I couldn't just grab a girl's hand and show her how to shoot the ball like I could with a male player or any other player here in the States. I had to describe how to do things but without physical contact. Which was fine, but challenging. Eventually a few members of the women's national team gave you a high-five, after they saw other female players do it at an international wheelchair basketball training camp in Thailand in April. How did that happen? Markt: They feel like now they're a part of the international community and can do the things that international players can do. Were you worried that you might be putting the women in danger by high-fiving? Markt: I wasn't too nervous. We were in a safe place, the gymnasium, and I definitely wasn't going to stifle their social breakthrough by ignoring the attempt. I didn't have a choice!